An unmanned SpaceX Dragon cargo ship is seen grappled by a robotic arm on the International Space Station on Sept. 22, 2014. The commercial spacecraft is SpaceX's fourth delivery mission to the space station and is carrying 20 live mice and the world's first 3D printer in space among its haul. A private Dragon cargo ship built by SpaceX arrived at the International Space Station today (Sept. 23) to deliver more than 2 tons of astronaut supplies and experiments for NASA, including the first 3D printer in space and an intrepid crew of 20 lab mice. After a two-day chase, the Dragon spacecraft caught up to the orbiting laboratory at 6:52 a.m. EDT (1052GMT). European astronaut Alexander Gerst used the space station's huge robotic arm to grab the capsule with help from NASA astronaut Reid Wiseman. The spacecraft is packed with 5,000 lbs. (2,268 kilograms) of experiments and supplies. Dragon launched into space early Sunday (Sept. 21) in a liftoff described by mission managers as "perfect." The capsule launched atop SpaceX's Falcon 9 rocket from Cape Canaveral Air Force Station in Florida just before 2 a.m. Sunday, one day later than planned due to a weather delay. After Dragon reached orbit, it spent two days catching up to the station through a series of carefully timed thruster firings. The flight marked SpaceX's fourth resupply mission to the space station under a $1.6 billion contract with NASA. The Hawthorne, California-based company has agreed to provide at least 12 Dragon supply flights to the astronaut outpost. 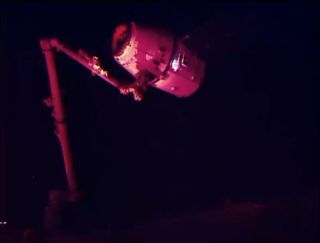 Dragon will remain berthed to the space station for about 30 days to allow astronauts to unload the new cargo and refill it with equipment to be returned to Earth. Among the novel cargo inside this morning's shipment is a NASA rodent habitat for biological research with an initial group of 20 tiny tenants. Astronauts quickly lose muscle and bone density during spaceflight. Scientists hope that studying the same phenomena in mice will help them understand more about how the human body degrades during long-term missions in space. Sometime before Dragon flies back to Earth, the robotic capsule will pop open its trunk so that controllers on the ground can reach in and grab a new instrument called RapidScat. The scatterometer will measure the speed and direction of ocean winds on Earth once it is installed on the outside of the space station. Some of the cargo onboard Dragon is booked for a round trip. A student-designed fruit fly experiment is slated to come back to Earth after 30 days; the researchers want to know how a group of mutant, stress-resistant fruit flies fares in microgravity. And the 3D printer built by Made in Space will churn out a few initial test parts and send them back with Dragon. Researchers with the California-based Made in Space and its partners at NASA's Marshall Space Flight Center in Huntsville, Alabama, want to learn as soon as possible how the quality of items printed in microgravity compares with the quality of parts made on Earth. Dragon will also return with a small crop of lettuce harvested from NASA's Veg-01 experiment, nicknamed "Veggie," which was first brought to the space station during SpaceX's last resupply mission in April. Scientists on the ground will analyze frozen lettuce samples to determine whether they're safe to eat, though researchers probably won't take a nibble themselves, said Marshall Porterfield, director of NASA's Space Life and Physical Sciences Research and Applications Division. "After it gets frozen in a minus 80-degree freezer, it's not too palatable," Porterfield told reporters last week. The delivery comes amid a big week for SpaceX. The company, which was founded in 2002 by billionaire entrepreneur Elon Musk, just won a lucrative NASA contract to transport American astronauts to and from the space station. Last Tuesday (Sept. 16), NASA announced that it was giving SpaceX $2.6 billion of its Commercial Crew Transportation Capability award. Under the deal, SpaceX will fly an enhanced seven-passenger version of the Dragon capsule to the space station from U.S. soil by 2017. Boeing also won a $4.2 billion chunk of the award to provide the same space-taxi service using its CST-100 capsule. In another milestone, SpaceX officially broke ground on its seaside Texas spaceport near Brownsville at the southern tip of the state yesterday (Sept. 22). The company plans to launch commercial satellites into orbit from the private facility in a few years. It's also a busy week for the space station, as a manned Russian spacecraft is expected to arrive in just a few days. The Soyuz capsule carrying three new crew members — NASA astronaut Barry Wilmore and Russian cosmonauts Elena Serova and Alexander Samoukutyaev — is slated to launch from Kazakhstan on Thursday (Sept. 25). They will join Gerst, Wiseman and cosmonaut Maxim Suraev as part of Expedition 41.